For over 40 years J&W Asphalt has been installing high quality asphalt driveways throughout the Twin Cities. From direct Customers to Large Builders, J&W is a leader. Professional Interface, Clear Call to Action. Cutting edge design and clear messaging for a highly effective business. 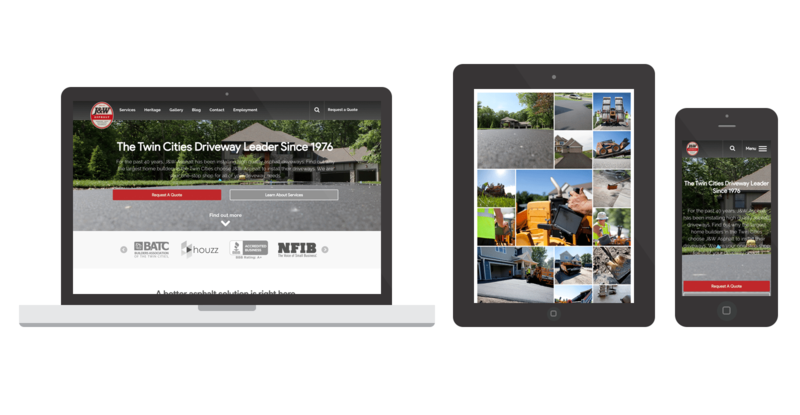 JW Asphalt contacted Spark Logix Studios, wanting to completely redesign their website with two goals in mind. First, they wanted to modernize the website. In their market, the websites of their competitors are behind the modern design trend curve by six to seven years. They wanted to be the first business in their market to modernize their website, and create an effective marketing tool for their clients. Second, they wanted to be able to receive quote requests digitally, including verifying their address via google maps. Because of their proprietary software, they are able to provide quick quotes for homeowners, provided their google map location is accurate, so we included a verification question on their new, responsive quote form. They also wanted to change their marketing focus, to expand their reach into a new market that had the potential to become incredibly profitable for their business. With all of that in mind, Spark Logix Studios created a powerful, modern design on their responsive Respondo Pro framework. That way, users see a beautiful site, no matter what device they use. Spark Logix Studios was up to the task, and created a great new site!